Houston may seem like a world away from Middletown, but for some students and alumni, it is a place they also call home. Category-4 Hurricane Harvey made landfall on the Gulf Coast of Texas early in the morning on Saturday, August 26, and its destructive force devastated entire communities. 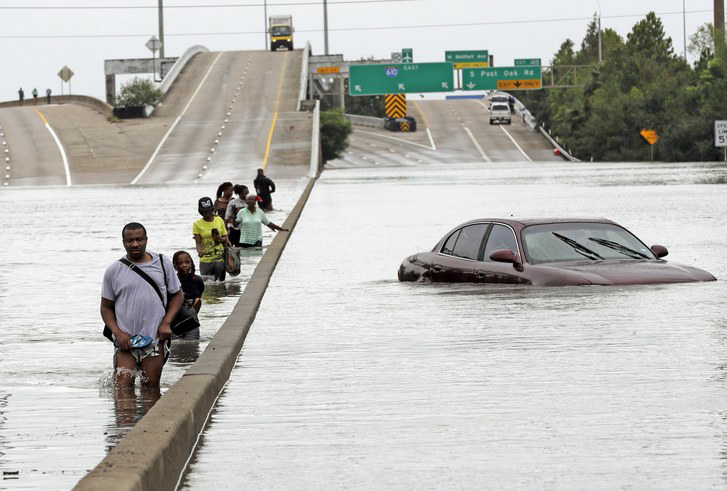 Houston, America’s fourth-largest city, was hit with three days of near-constant rainfall. Harvey, which was downgraded to a tropical storm, hovered over the metropolitan area and its surrounding towns, causing catastrophic flooding and billions of dollars in damages. The storm has again made landfall, this time as a tropical depression, near the Texas-Louisiana border, where continued heavy rainfall is expected to overwhelm and incapacitate rural communities. The storm is also expected to have a major financial and environmental impact after the shutting down of major oil refineries and a chemical fire reported in Crosby, Texas. In order to accommodate those in the University community who may be impacted by the storm, the Office of Residential Life sent a campus-wide email informing students that they will be assisted in making alternative travel arrangements to campus as the new year begins. On his blog, University President Michael Roth directly addressed the disaster and the ways that those on campus can be of assistance to those in Texas and Louisiana. “Our hearts go out to those struggling with this historic catastrophe,” Roth wrote. Links to lists of various organizations accepting donations are provided on the blogpost as well. According to Houston resident Jackie Buskop ’19, local organizations are more in need of donations and more likely to use them effectively. She recommends giving to Houston Society for the Prevention of Cruelty to Animals, Houston Food Bank, Texas Diaper Bank, Houston Humane Society, Portlight Inclusive Disaster Strategies, Star of Hope, and Coalition for the Homeless. Focused on the relief effort ahead, Buskop noted the importance of donating responsibly. Aimee Jones-Wilkerson ’17, who moved to Houston following graduation, is also safe, though she noted that the area suffered extensive damage. As a teacher in the KIPP Houston school district, Jones is aware of what lies ahead. “KIPP Houston, my school district, has started a fund for students and their families that may have suffered damage to their homes, cars, or other necessities,” she said. Alex De La Rosa ’19, of Dickinson, Texas, was, fortunately, visiting family in West Texas when the storm hit. His home and family were spared any direct damage, though buildings in the town did experience structural damage. “Everyone is safe and doing well,” he wrote in an email to The Argus. In a trying time for Texas and Louisiana residents, generosity still abounds. Countless stories of local heroism and solidarity permeate the overwhelmingly negative news. Buskop was quick to offer up what she could from her home in Houston. “So far almost everyone we know is safe and we have dry ground and a spare garage apartment,” she wrote. The community has mobilized to begin what is sure to be a long path to recovery. This article will be updated with information from students and alumni as it is received.